Autumn in Japan offers a great selection of fall foliage, festivals, and delicious food. This guide provides you with travel tips to make the most out of your fall vacation in Japan. Autumn in Japan is a season with mild weather, beautiful nature, special events, and delicious food. Every season in Japan has its own appeal and merits, and fall is known to be a relaxing and entertaining time for travel. This guide is for anyone considering a trip in the fall. Autumn in Japan comprises of September, October, and November. In September, temperatures tend to be around 23ºC to 28ºC (73°F to 82°F) in the afternoon and drop to about 18ºC to 21ºC (64°F to 70°F) in the morning and at night. In October, afternoon temperatures range from 19ºC to 23ºC (66°F to 73°F), and morning temperatures tend to be around 14ºC to 18ºC (57°F to 64°F). In November, afternoon temperatures are about 14ºC to 18ºC (57°F to 64°F) while morning and evening temperatures are 7ºC to 12ºC (45°F to 54°F). Although there is a chance that typhoons may occur between September to mid-October, the weather is comparatively comfortable in autumn. For further information, see Autumn In Japan 2018 – How To Enjoy The Autumn Leaves Season to learn more about weather conditions in fall. There are many different activities and events you can enjoy during this season. Autumn is synonymous with koyo, or autumn leaves. 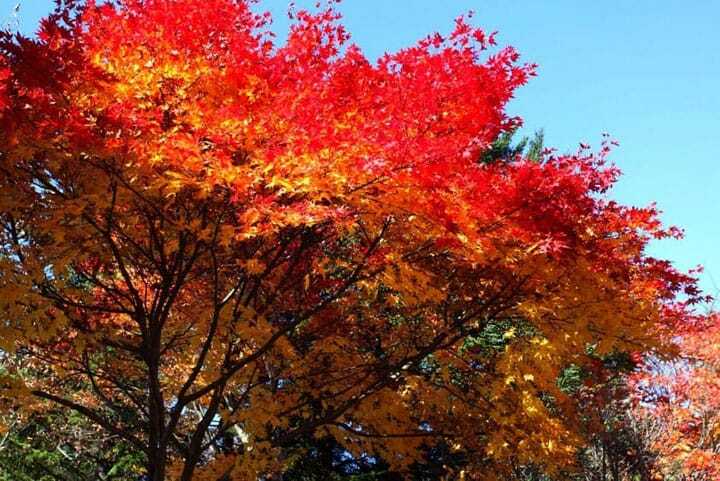 It is the perfect season for momijigari, also known as seeing fall foliage, with the leaves of deciduous trees turning brilliant shades of red and yellow. The autumn colors gradually make their way from the northernmost prefectures down south. The timing of color change is dependent on annual climate variations, but on average the best time to see fall leaves in each area are as follows: from late September through mid-October in Hokkaido, from mid-October to mid-November in Tokyo, from mid-to-late November in Osaka, and from late November to early December in Kyoto. In early to mid-fall, you will find numerous events as well as people gathering for tsukimi (moon viewing). Practiced traditionally since the Heian period, groups of friends and family get together to view the moon while enjoying dango and sake. Some events will held also will contain a ceremony to show appreciation for the seasonal harvest of rice. If you want to experience a traditional event unique to Japan, taking part in a moon viewing celebration is a great way to do so! Fall is a season full of festivals, like the Kishiwada Danjiri Festival in mid-September, which originating from prayers to the gods regarding a successful harvest. Intricately-carved wooden festival floats are paraded throughout Kishiwada in the Osaka area. In October you can witness the Sawara Grand Festival in Chiba prefecture. It is designated as Intangible Folk Cultural Property in Japan, containing a history of around 300 years. Halloween has gained some popularity in recent years as well. You will also find many Halloween celebrations in Japan such as special events at Tokyo Disney Resort and Universal Studios Japan. Crowds also gather in Shibuya, Kawasaki, and other large metropolitan areas to celebrate on the streets in costumes. 5 Essential Ways To Celebrate Halloween In Japan! Picture from Roasted Sweet Potato Shop Fuji - Choose Between 8 Different Flavors! Japan is abundant with delicious food during the fall. Numerous crops come into season, fish like bonito and saury, fruits like persimmons and pears, as well as chestnuts, matsutake mushrooms, and gingko nuts. These seasonal ingredients will most likely make an appearance in some of the dishes you eat during your travel! If you are interested in trying something sweet, look for special wagashi (Japanese sweets). Seasonal wagashi will feature flavors like chestnut and persimmon in the autumn. Another sweet snack is yakiimo (roasted sweet potato). You will find yakiimo sold in a variety of areas, from specialty stores and food stands to little trucks. Autumn leaves paint the whole country crimson and gold in this season. For travelers trying to maximize their fall experience, we especially recommend the following areas. Kyoto is undoubtedly one of the best areas to be for seeing the spectacular Japanese fall landscape. Spots like Kiyomizudera Temple and Tenryuji in Arashiyama are very famous for their beautiful fall leaves, offering a unique view together with the traditional temples and shrines. You can also visit certain shrines and temples at night for magnificent light displays. Venture north beyond the city center, towards the Kitano and Kitayama areas if you want to avoid crowds. Full of nature, the northernmost prefecture of Hokkaido is home to breathtaking scenery all year round, which becomes illuminated beautifully with the red and gold colors of fall. Since Hokkaido is quite large, you may want to rent a car to move around more easily, but many of the places are accessible via public transportation. Well-known areas to see fall leaves include Onuma Quasi-National Park north of Hakodate and Mt. Moiwa in Sapporo. The metropolis of Tokyo is not without its share of beautiful fall colors. Certain areas will be crowded depending on location but access within the city should not be an issue. We suggest holding a picnic or reading a book under the gold and crimson shaded trees at Yoyogi Park or Shinjuku Gyoen. Another must-see is the foliage at Rikiguen (pictured above), one of Tokyo's most renowned Japanese gardens. Hakone in Kanagawa prefecture, south of Tokyo, is well-known for onsen (hot springs). In autumn, the landscape will be sprinkled with shades of red and gold. Located around an hour and a half away from Shinjuku in Tokyo, Hakone also makes for an ideal day trip. At Lake Ashinoko you can get a glimpse of Mt. Fuji together with the autumn leaves on a clear day. You can also travel to Sengoku Plateau and surround yourself in an endless field of golden Pampas Grass. During September in Japan, there will plenty of warm afternoons when you can wear short sleeves. However, the mornings and evenings might be cool, so have some long-sleeved shirts or light cardigans on hand. In October, long-sleeved shirts are ideal for sunny afternoons. Bring a sweater or a hooded jacket for cold mornings and evenings. November tends to get much colder, so we recommend wearing a jacket or sweater during the day. Depending on the weather you might also need a coat. Autumn in Japan means pleasant temperatures, beautiful fall foliage, festivals and events, as well as delicious autumn food. All of these elements come together and make autumn a great season to travel to Japan. Feel free to use the information above to plan your autumn trip to Japan. Weather In Kyoto And Osaka In September-October: What To Wear?